Experience Roatan Island and have a Caribbean vacation when you come. Escape and unwind in our comfortable privately owned Cabana home. 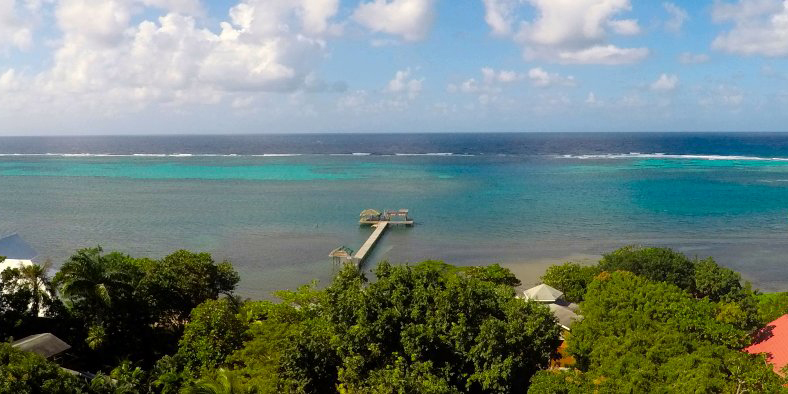 This tropical island cabana community offers vacationers an opportunity to get away from noisy Roatan hotels, condo's, busy accommodations, and the cruise ship numbers; to a relaxed, simple, "island style" vacation. 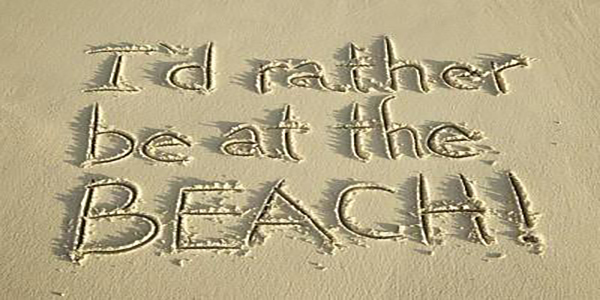 Roatan Island Private Sandy Bay Vacation Rental at Sundancer Cabanas! The island style cabanas are nestled in under the jungle canopy to keep the homes cool and the beach front has a private 300 ft. long pier. Sundancer Cabanas' best kept secret is the incredible snorkeling. 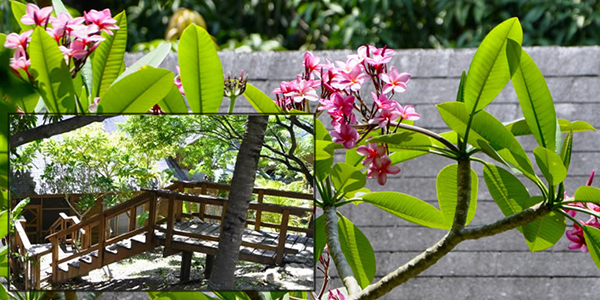 Our private standalone cabana is surrounded by lush tropical foliage such as this plumeria tree and other bamboo, palm, mango, banana and cashew trees, as well as exotic plants and blooming tropical island flowers like hibiscus. The best part of the end of day of sunning, swimming, snorkeling, diving, walking, playing with monkeys, zip lining, sea kayaking, paddle boarding or just soaking in the sea is to relax on the fully screened porch surrounded by beautiful tropical plants. The Colburn's welcome you to Sea Breeze their 3 bedroom, 2 bath private cabana home for your tropical island vacation rental. Right away you will love how comfortable and spacious this home is with an open kitchen and living-room design decorated with an artistic flair full of bright tropical colors. Even the doors on the main level of the home are hand carved in a reef motif! This is my second home and not a typical vacation rental. I take a lot of pride in my cabana and have enjoyed making it as comfortable as possible. 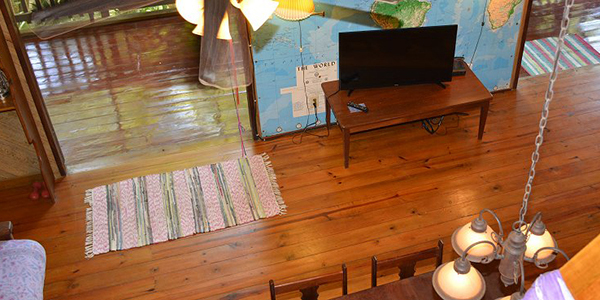 I have tried to retain much of the island charm, yet also offer up to date conveniences. I have recently added cable TV and upgraded my Internet service. However, the choice is yours. If you prefer, don't turn that power button on! Carpe diem. 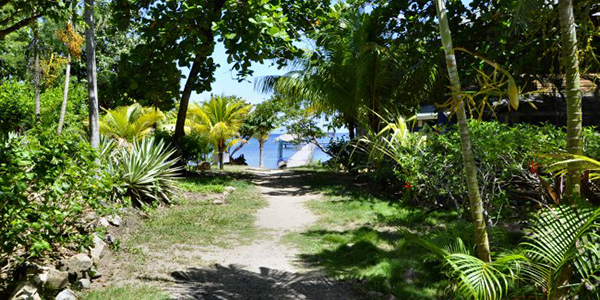 Welcome to our Roatan cabana home in Sandy Bay. We hope you enjoy it as much as we do! Having 3 children makes our Roatan vacations quite an adventure. 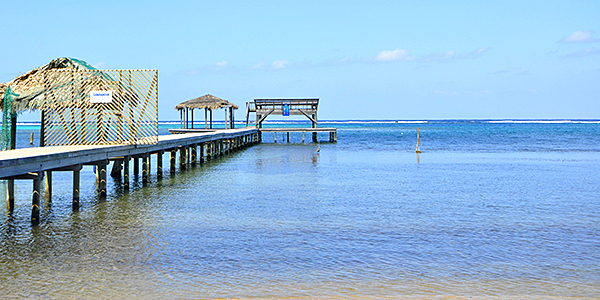 Your Roatan adventure can begin right here in our 3 bedroom, 2 bath, private Sundancer Cabana home. You can enjoy all the Roatan air you want with fully screened windows, doors, upper porch and fans, OR take advantage of our whole house airconditioning feature with units in every bedroom, loft and living area. "Vacations mean a change of pace, a gentleness with ourselves, a time of rest and renewal, and a time to stretch ourselves and encounter new people, new lands, new ways, and new options." The hostel is owned and operated by Mel James, a Canadian who's been on the island for over 17 years, and who lives on property with her 2 sons. We love to help our guests experience the real Roatan, so you'll get a thorough orientation when you arrive, and are welcome to a copy of our hand-drawn map of the island. coming soon... Laoreet nam lacus, sed nostra. Tellus nec nunc, eu tempor, nam donec quis. In laoreet, montes wisi tellus. Orci id etiam, vulputate nam laoreet, orci justo amet. Eget ante aptent. Massa eget, id est nec, placerat tempor justo. Accumsan amet, nisl etiam. Integer purus dui, a rutrum proin.